We're always interested in novel and well made photo gadgets and accessories. The attractive four leg copy stand holding a camera that is shown repeatedly in the laboratory on the TV program CSI Miami looks like it might be useful for photographing documents, photo's, railroad collectibles, etc., although it apparently was intended especially for crime scene investigators and firefighter photography. It was hard to find information, so we though it might help someone to provide links. There are two models, the original Quadra-PodTM Copy Stand (US Patent #5993077, trademark), and the more adjustable Quadrapod EliteTM Copy Stand (Patent Pending, trademark) shown below. The only licensed reseller is Richard McEvoy at Forensic Imaging, Inc., (585) 924-9410, or they can also be ordered directly from the inventor, Steven P. Jones, 5507 Moultrie Road, Springfield, Virginia 22151, (703) 321-8106, quadrapod99@earthlink.net. Image courtesy of Steven P. Jones. Right now, I have only 15 more of the Quadrapod Elite units. This was the first article production to determine if the product meets consumer and professional needs. I've had favorable response in each area and it's likely I will gear up for second build. Because many of the parts are hand fabricated, such as the "T" bar clamps and the modifications to the delrin slider I only make about 50 units at a time. I expect to begin the next batch in mid-April. It's likely the Elite will increase in price (you might want to suggest to your bloggers that they should contact me for the up-to-date price). The fine telescoping tube legs are purchased in Italy and I import them back into the US which is another costly and involved process. It's worth all the trouble because the quality is excellent. However, the incredible dollar to Euro exchange rate has made a serious impact on the cost of the legs and shipping. The original Quadra-Pod Copy Stand is readily available through Forensic Imaging, Inc. If a request comes to me, Forensic Imaging, Inc. or Mrs. Janney it's processed promptly. I believe in quality, service and value [which happens to be the business model for McDonald's Corporation]. The buyer gets a good product, service if needed, and excellent value. ... The copy stands are often seen [in] the laboratory, the library as well as in the field. I've provided copy stands to medical professionals as well as genealogists; however, the forensic document examiners and crime scene investigators frequently call for new equipment. It's exciting to know that there's another market in the Museum industry! Thank you!!!! I've been searching for this device since I first saw it on CSI Miami. Only a year of searching, finally using the term "copy stand seen on CSI" produced this blog. 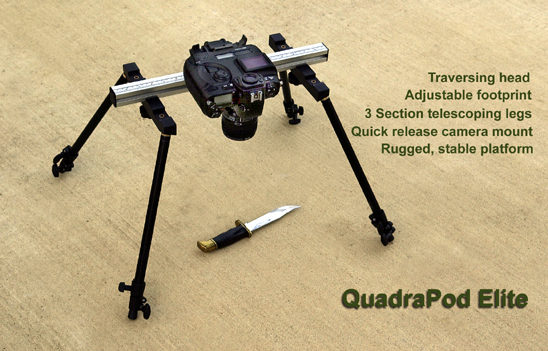 Never thought to search "quadRApod" only used "quadpod"
Glad to hear that our blog was helpful to you in your search. Tripod: Another terrific product is the Rainer Burzynski Pro-Tec Tripod Ball Head II (be patient while he makes one for you!) which U.S. buyers can get while paying more reasonable postage charges from the Photo and Nature camera store in France. Works great with the Gitzo GT3541XLS Series-3 Systematic, 6X carbon fiber 4 section tripod legs, and Really Right Stuff PCL-1 Panning Clamp for Arca Swiss quick release mounts available for your camera or lens from RRS, Kirk, Wimberley, and Markens. I too had seen these on CSI and was wondering who made them - and IF there were people who actually used them. Nice to see them out there - but am wondering what made the Patent 'acceptable' - as ... we were making something similar in the 1970's (funny, same for cam to spotting scope adapters too). But thought they were common and never gave a thought to any patent. Nice going.